You'll love these Speech Bubbles are perfect for your resource! You can use them for directions, tips, hints, story starters, messages, and the list goes on! 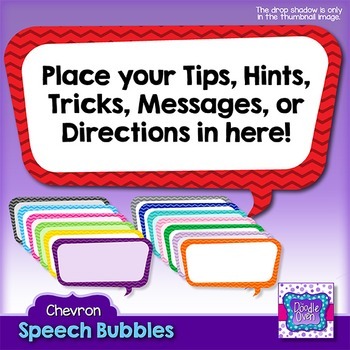 These speech bubbles have chevron print and are rectangular in shape. These speech bubbles are 300 dpi large format files---so they are perfect for bulletin boards, games, printables, etc. You may use these for personal and commercial items, but certain restrictions and requirements may apply. You MUST provide credit in the form of a reference in your TOU page and copyrights must remain visible and readable on prints. Due to the nature of digital files, no returns or refunds are available.